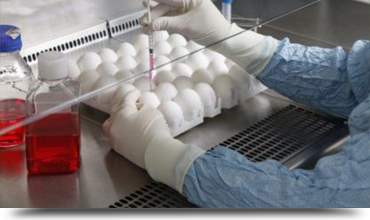 VALO BioMedia Clean Eggs are a highly appreciated product used by pharmaceutical companies for the production of human flu vaccines or inactivated animal vaccines. Flocks under strict hygiene and biosecurity controls are used to produce VALO BioMedia Clean Eggs. Customized product specifications are defined by the customer and may include common quality measurements, such as fertility rates, or could include specific needs, such as the vaccination program of the source flock. Here again the direct access to a special breeding program and the extensive production expertise within the EW GROUP enables VALO BioMedia to source parent stock with superior genetic potential and to produce eggs of the highest possible quality. Along with the reliability of our service, this legendary quality has helped us become the leading supplier of Clean Eggs. The breeding index shown below gives an overview of the genetic traits used in the selection of SPF and Clean Egg pedigree lines.